The Most Beautiful Skydive in the World! 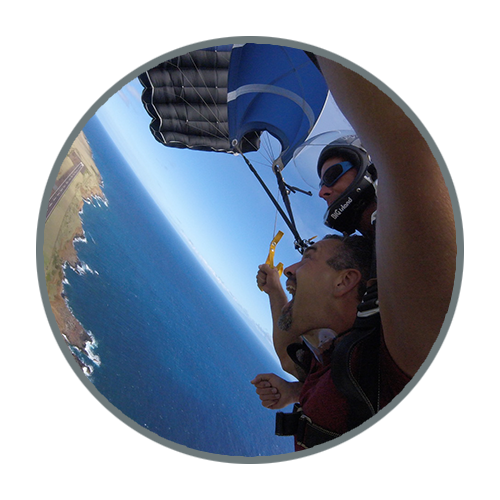 We will climb to your skydive over the Seven Sacred Valleys and the majestic Kohala Coast to see full of dozens of massive waterfalls and black sand beaches prior to exiting the aircraft from near 12,000’ attached to your skilled and experienced Skydiving Instructor! Freefall feels like flying, or floating, and is blissful to experience. As you descend a vertical mile in freefall, over about 45 to 50 seconds, your body and mind perceive the sensation as floating and taking in the otherworldly beauty. 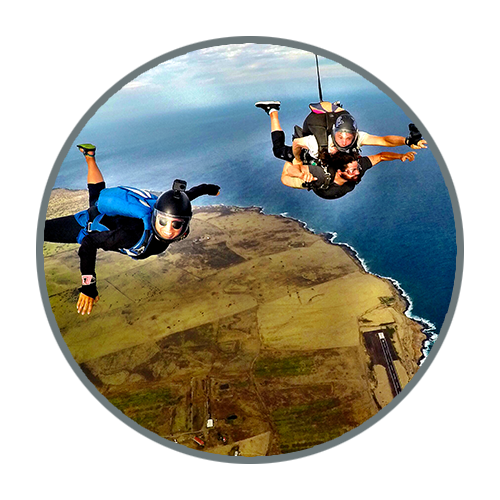 Your experience shifts to silent exhilaration when your parachute deploys and your skilled instructor shows you how to steer along the rugged Kohala Coastline, and land softly on the oceanfront grass of Upolu Airport. Your professional skydiving instructor will film your entire experience, including interviews, scenics, and your skydive! This footage is edited and then posted for you online, typically within 48 hours of your skydive, and often sooner. For a limited time this video is included free, and your secure booking will ensure that this offer is secured as well. Every premium skydive package includes a free, professional video of your adventure. A flight tour where some passengers get to skydive, while others stay safely belted in their seats! Our premium, tandem skydive package includes a free, professional video of your adventure – including interviews, as well as the freefall, parachute ride, and scenics. Shots are captured by your tandem instructor, so please do understand if some portions may be missing or unusable due to the nature of the activity. 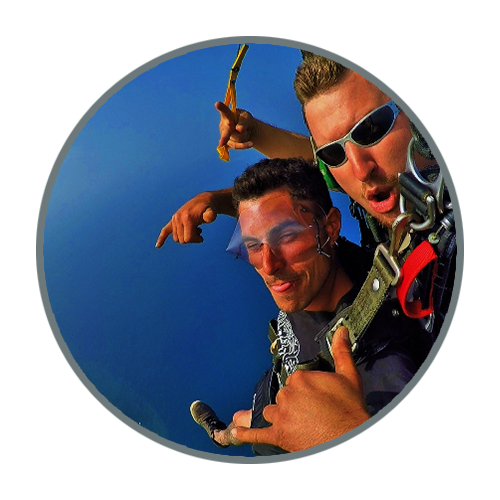 Upgrade your video by having a second skydiver photographer jump along with you to fly in and capture a third person perspective of your free fall and landing. The two videos are then edited together for a complete and extended ultimate video! This option is not available on every flight, so request it ahead of time for the best availability. 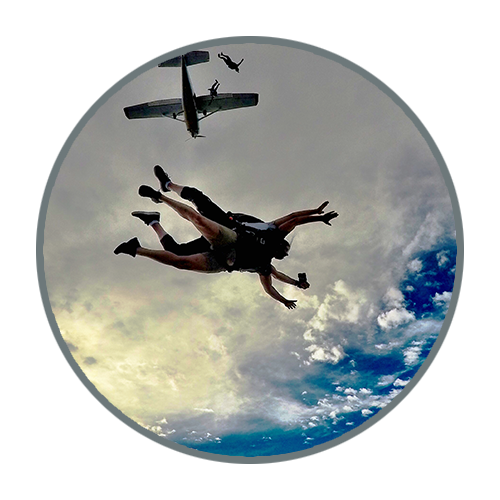 Tandem Skydive, including a scenic flight and edited video of your skydive, only $339. per person. and save 6% in online booking fees. Helpful tips for reserving a skydive! Skydiving is reserved every morning, but the best advice is to book early in the day for the best views and weather. We start at 6 am for the sunrise skydive, and book on the hour after that. Your skydive experience will typically take about 2 hours, however sometimes delays will accumulate as the day goes forward so we suggest that you allow for 2 to 4 hours for your visit. Booking a early time of day will reduce the potential for delays, and in that way will reduce the overall time required for this experience. Additionally book early in your stay, for the most flexibility in the event of a poor weather day for skydiving. 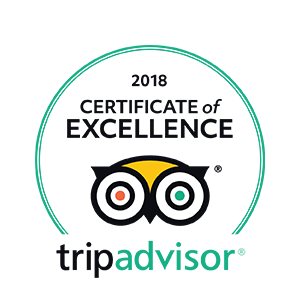 Book now to find the best availability, as the prime times to book are also the first to fill up! Calling or Texting 808-937-9258 will save you the convenience fee which is charged with online bookings, and you may find that there are discounts that may apply, saving you up to 50.00 per person! Reservations are required. Please contact us right away for the best availability. Please contact us by Text, phone, or email to reserve your seats on the airplane at the best price. Bookings made online are charged a convenience fee of 6%. This can be avoided by texting or calling 808-937-9258 to place your booking. Book Early, Early and Early! Book Early for the best times and availability! Book Early in your stay for the best flexibility in the case of poor weather, Book early in the day for the best views and most reliable island weather patterns! Reservations are confirmed with a credit or debit card. Reservations are transferable and may be rescheduled due to weather or other reasons beyond our control. Due to the commitments of our aircraft and instructors who have committed to your booking, cancellations must be made more than 48 hours before your reservation or will be charged in full, however, your credit may be used for up to a year in that case. Our policies are the most flexible and friendly in the industry, and your deposits never lose value. Our best marketing and business practices include treating our clients with respect and honesty! You will be glad that you are flying with B.I.G. Air Tours! The nature of skydiving makes weight limits necessary. If you weight more than 240, let’s talk, we may be able to take you skydiving, depending on the instructors available that day. The skydiving industry safety regulations state that a person must be 18 to skydive. We adhere to these safety regulations, and so you must be 18 to skydive with us. Please be prepared to show your identification when you arrive. Mahalo for your understanding! 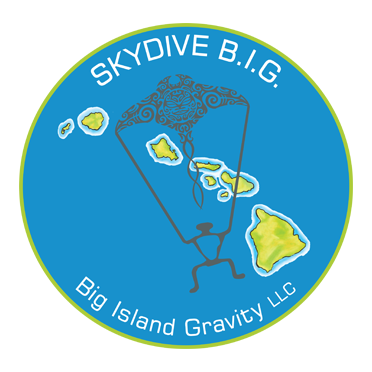 Big Island Gravity LLC - Home of the Worlds Most Beautiful Skydive!